Today marks the 25th anniversary of the B-2 Spirit's inaugural flight. Through its quarter-century of service, the original Stealth Bomber has earned its place among the most elite warbirds in the USAF fleet and remains a vital weapon of the US arsenal to this day. It's a plane that could start—or stop—WWIII single-handedly. With the rise of modern radar and anti-aircraft batteries in the 1980s, the US military found itself in a tenuous position, uncertain that it could continue to attack high-value enemy targets with the abandon that it had enjoyed in the years after WWII. As a result, the military began pouring money into low observable (aka stealth) technologies in an attempt to counter these improved detection systems. Well, technically, development for the B-2 Spirit began a little bit earlier as part of President Carter's "Advanced Technology Bomber" (ATB) program, but the system really picked up speed in the early '80s under President Reagan. The plane made its public debut in 1988, flew for the first time the following year, and saw its first combat mission during Operation Allied Force over Serbia in 1999. The B-2 Spirit, at the time of its development by Northrop Grumman, was lightyears ahead of anything we had in active service. It was the first US military aircraft to employ newfangled computer-aided design and manufacturing techniques, the first to incorporate curved surfaces (which throw off incoming radar beams) into a low observable platform, and remains the one of the only aircraft in the arsenal to combine long range, massive payloads, and stealth into a single platform. All at the low, low discount price of $737 million per plane (in 1997 dollars). The B-2 leverages a flying wing design 172 feet wide and 69 feet long. The four, 17,300 lbf GE turbofan engines are internally located within the plane's wings which, along with an advanced exhaust temperature control system, help to minimize its thermal signature. This huge power plant is necessary due to the enormous weight of the ordnance that the B-2 carries—up to 50,000 pounds of conventional and nuclear weapons, that's 20 tons of explosives—but still provides a top speed of mach 0.95 at 40,000 feet and a range of 6,000 miles. That's roughly the distance from Whiteman Air Force Base in Missouri, where the B-2s reside, to Pyongyang, NK. With a single mid-air refueling, the B-2's range tops out at more than 10,000 miles though when cruising at 40,000 feet, the B-2 consumes up to 45 tons of fuel every 6 hours so aerial pit stops are vital—up to 5 refuelings per 30-hour mission. While the flying wing design helps to minimize the plane's radar cross signature and provides a highly efficient flight envelope, its inherently unstable flight characteristics require a steadier hand than what a human can provide. Therefore, the B-2 uses a fly-by-wire flight control system to automatically collect environmental data, such as airspeed and attack angle, via pilot-static sensing plates and then adjust the aircraft's flight surfaces accordingly to maintain control. The flight control system is so advanced that the pilot can toggle between three flight types: takeoff, landing, and "go-to-war" simply by flipping a switch. The computer will take care of the rest, selecting the appropriate avionics and equipment for the activity. In fact, the B-2 offers such a high level of flight and navigational automation that the two pilots (or rather pilot and mission commander) can alternate duties during the mission with one monitoring the aircraft while the other cooks a meal, uses the onboard latrine, or even catches some shut eye. Since the B-2 was developed first and foremost as a Cold War strategic bomber capable of penetrating dense radar defenses, its stealth capabilities are top-notch. The plane incorporates advanced avionics to help detect and avoid upcoming radar batteries such as the AN/APQ-181 multi-mode radar, nap-of-the-earth (ground hugging) navigational radar, GPS, and a defensive management system that can detect and assess the capabilities of upcoming threats and targets. What's more, the B-2 reportedly can shrink its radar signature of just 0.1 m2—that's roughly the size of a coffee cup—when it approaches a target, though how the plane accomplishes that feat remains highly classified. When that happens, the only thing enemy radar batteries detect is a tiny blip as the B-2 opens its bomb bay doors and unloads on its target. Not surprisingly, you don't want to be underneath a B-2 when it opens its bomb bay doors. The plane's internal bomb bays can hold up to 80 Mk-82 or GBU-38 500-pound bombs, 36 750-pound cluster bombs, 16 2000-pound Mk-84 or GBU-31 bombs, or as many as 16 nuclear B61 or B83 nuclear bombs. It is also the only platform in the US arsenal that can deliver our Massive Ordnance Penetrators (it can carry two) as well as the AGM-129 ACM cruise missile. 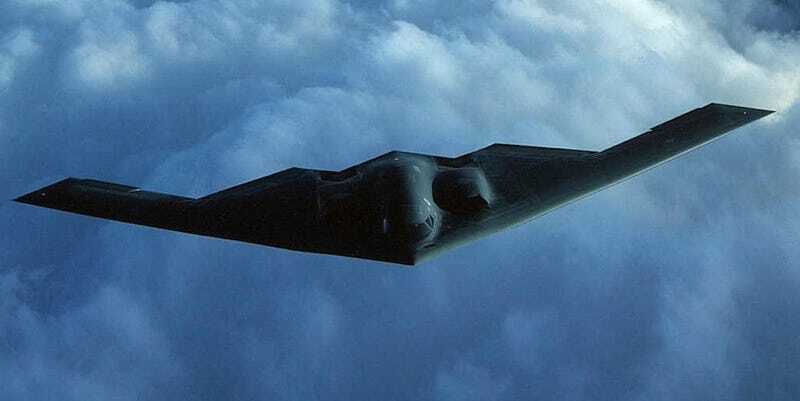 There are also reports that the USAF is working on a "Long Range Standoff Weapon" that would allow the B-2 to target installations over the horizon with nuclear ordnance, an unprecedented capability.